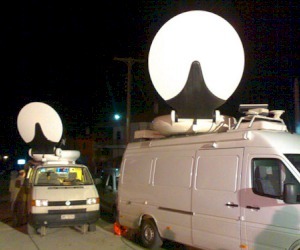 Satellite transmission van (VW Transporter) with 1.5m antenna with autopoint controller by GIGASAT, 400W HPA (XICOM) and 4:2:0-4:2:2 GIGASAT encoder with SDI input. Fully redundant transmission chain (1+1) and MPSC capability. The baseband part is analogue and includes PAL/AA router by PESA (LNS8), CRYSTAL VISION interfaces, MARSHALL monitoring and VTRs by SONY and PANASONIC.